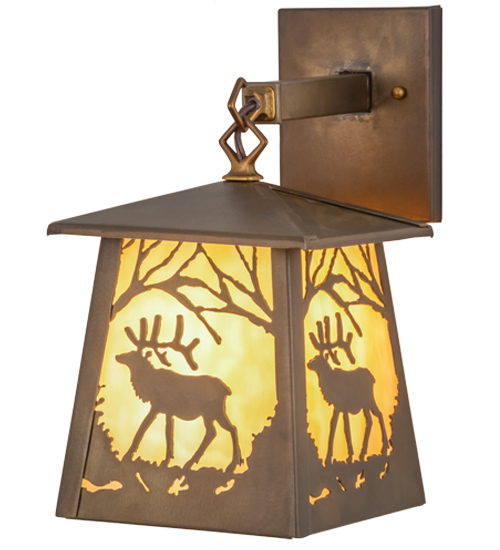 Description: Rustic charm is captured beautifully with this majestic Elk strolling in the forest while the morning sun rises in the background of this natural wildlife inspired hanging wall fixture. Soft ambient light projects through stunning Beige art glass, which is complemented with a frame and hardware hand finished in Antique Copper. The fixture is handcrafted by Meyda artisans in the Yorkville, NY manufacturing facility at the foothills of the Adirondack Mountains. Custom colors, styles and sizes are available, as well as energy efficient lamping options.